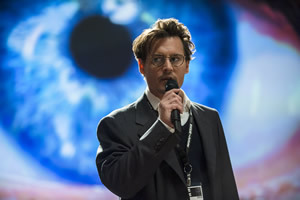 Transcendence pulsates with ambition and ideas, but it stumbles through the final act. The opening scenes set the stage for a collision between humanity and technology. It appears to be the end game of a war or a plague. There are rumors of power in Boston, some phone service in Denver. A comment is made that the Internet was supposed to make the world a smaller place, but the world now feels smaller without it. Regardless of the cause, it’s not a pretty picture for mankind and the movie backs up 5 years in order to explain how we get to that grim point. The tone and pace are similar to Christopher Nolan’s work, particularly Inception. Here, Nolan serves as executive producer while his long-time cinematographer, Wally Pfister, takes the helm as feature director for the first time. As the story begins to unfold, Pfister effectively plays off that opening sequence as tension and a slight sense of dread permeate events. At the heart of it all are Will Caster (Johnny Depp, The Pirates of the Caribbean series), a world-renowned expert in artificial intelligence, and his wife, Evelyn (Rebecca Hall, Iron Man 3), who is every bit his match when it comes to thinking big and dreaming out loud. The problem is the Casters and their work have their detractors. Attacks at AI data centers and research centers across the country fill the headlines even as Walter is shot following a high-profile presentation at a fundraising event. Walter’s prognosis isn’t good and he’s expected to have only 4-5 weeks left to live. In addition to Transcendence being Pfister’s directorial debut, it’s also the first screenplay by Jack Paglen. It’s lofty, ambitious material that could easily be chided or derided as the third act unfolds and some snicker-inducing dialogue unintentionally threatens to derail the earnest message and well-meaning themes. That dialogue revolves around the uploading and downloading of people’s minds on and from the Internet. “Martin has my source code” takes on a whole new meaning here from the typical chatter in software and Internet development shops around the world. Evelyn’s need for a more powerful processor also needs to be held tightly within the context of the situation at hand. The knee-jerk reaction is to snicker, but ultimately they’re using the vernacular of the industry. What to do? What to do? The best advice is to look beyond those moments of funny-sounding dialogue. There’s too much here to let that kind of relatively inevitable talk get in the way of enjoying and pondering the bigger picture. Keep in mind the little touches, like Will’s “Unplug” tattoo and the conflict of ambitions between Mr. and Mrs. Caster. This is one of those movies that will likely benefit from a second viewing. For one thing, it wasn’t plucked out of a cookie cutter. This is something new - even with some echoes of HAL from 2001: A Space Odyssey and the virtually requisite acknowledgement of memories being an essential part of the human experience and individual identity. With ideas like cell regeneration, digital printing and the notion of shutting down the Internet all figuring into the ideas in Transcendence, it is ultimately a cautionary tale about the rapidly growing power of technology over humanity and the mighty role technology plays in the human condition. But that’s not to say Transcendence is too serious for its own good. The first two acts are filled with really good, effective drama that reach far out levels of technological application and notions that really might not be all that far-fetched in the not-too-distant future. However, given some of the discomfort some of the ideas could pose to some people (big picture items like life, death, fear-mongering and techno-terrorism), it’s helpful that Pfister has called on a number of familiar faces from Nolan’s growing canon of movie marvels to help navigate audiences through the material. Rebecca Hall, for one, also appeared in The Prestige. There’s also Lukas Haas (Inception), Josh Stewart (The Dark Knight Rises) and Morgan Freeman and Cillian Murphy (The Dark Knight trilogy). There’s fun to be had in piecing together the cast and the Nolan connection. But the movie itself stands as one worth seeing on its own merits and serves as great post-movie coffee shop chatter material. For all the technology on screen and behind the scenes, there are also a lot of art house ambitions at play.